Printing often isn’t easy for iOS users—especially in large organizations. 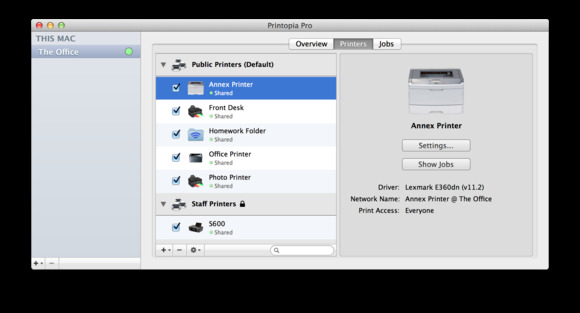 Luckily, Massachusetts-based Ecamm has just released Printopia Pro, an enterprise-class version of its extremely popular Printopia utility, which allows iOS apps to print to any printer without the need for special iOS software. 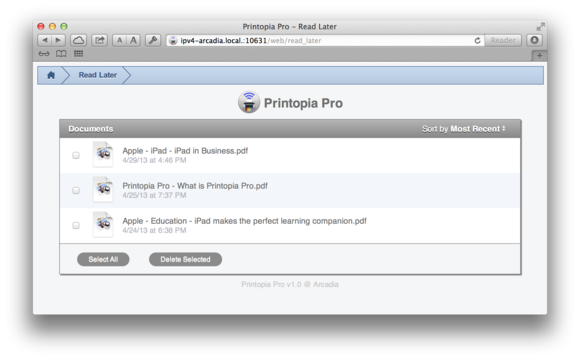 Like its consumer-level counterpart, Printopia Pro runs on a Mac and acts as an AirPrint server, allowing iOS devices to connect to it and send documents as if they were dealing with a real printer. It also circumvents the need to buy a printer model that supports Apple’s AirPrint—most of which are aimed at the consumer market, rather than SMB or enterprise. Printopia Pro adds a number of features designed for corporate users to the mix, such as additional security, improved support for complex networking setups, and the ability to centrally manage arbitrary numbers of printers and users, tightly controlling access and privileges. Printopia Pro adds Web Folders, letting you print documents directly to shared Web space that can be accessed throughout your organization. According to a company press release, the software is fully scalable, can support hundreds of users and printers from a single server, and is even capable of storing—rather than printing—the documents it receives to one or more Web-enabled folders. From, there documents can be accessed as part of more complex workflows for a variety of applications, ranging from education to business processes. However, it does lack some of the more consumer-facing features of Printopia, such as sending to a specific application or Dropbox. Printopia requires OS X or OS X Server version 10.7 or later, and is compatible with iOS devices that run at least version 4.2 of the mobile operating system. Pricing varies between $79 and $500 per server, based on the number of printers and features desired. Ecamm also makes a fifteen-day trial available at no cost. Updated at 4:33 p.m. PT to clarify the list of printers that support AirPrint.